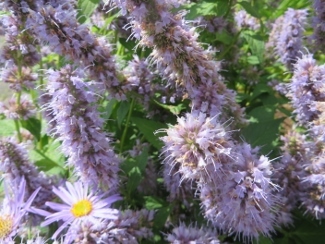 Joy Creek Photo Archive (c) all rights reserved Agastache 'Blue Fortune' boasts all summer bloom spikes of lilac blue flowers that are great for attracting bees and butterflies. The leaves of this upright perennial are aromatic and can be used to flavor tea. Very easy to grow and vigorous. A Great Plant Picks selection. If grown organically Agastache foeniculum leaves and flowers can be used as a culinary herb with an anise flavor. This is one of the Agastaches that will grow well in less than full sun, it just does not grow as tall as it does in the sunny border.